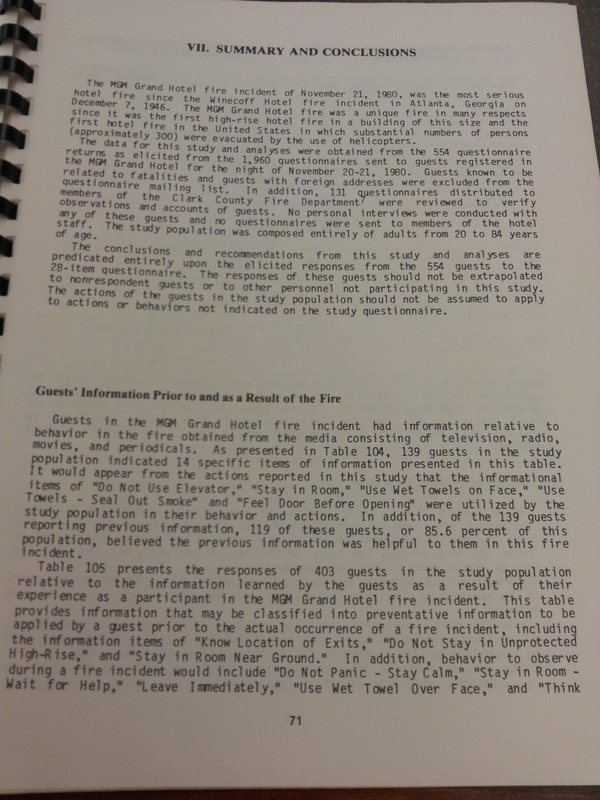 I recently began researching a topic at the UNLV archives which I’ve had an interest in for a few years now: the MGM Grand fire which occurred the morning of November 21, 1980. I wrote a blog on the fire which can be viewed *here* that averages 2-3 hits a day, which indicates to me there are others interested in the fire after all these years. Having spoken with several locals who lived here when the disaster happened, I’ve heard some firsthand accounts of the sights, smells, and sounds of that day, all of which have been harrowing. I’ve also seen some unreleased MGM Grand security photographs of the casino level after the destruction and I must say they prompted me to postpone my research awhile back because they were so difficult to process. 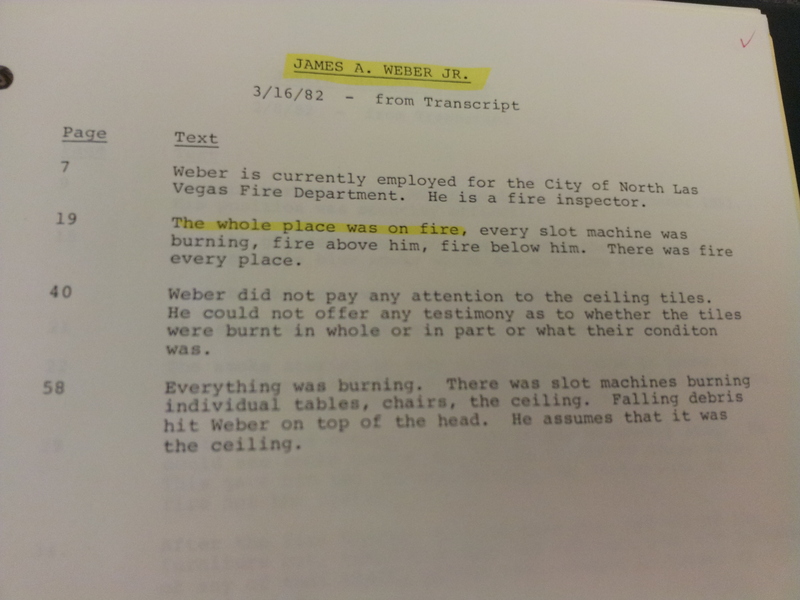 This fire inspector’s account gives one an idea of the devastation the fire wrought on the casino level alone. At this point I’m not sure what the scope of the project will be, and if the end result will be an e-book or a printed book (or both). It’s my personal feeling that there’s a need for more people’s stories to be told who survived this disaster. Having worked in hotels for fourteen years, I cannot begin to imagine working a shift during such a disaster as this fire; it’s certainly not something I take lightly nor something in which I have a morbid curiosity. Believe me when I say it’s something I’ve been researching with the utmost respect, and something which I’d carry out the interviews in the same manner. If you or someone you know survived the fire and would be willing to be interviewed, please message me and I will respond back with some qualifying questions to proceed with the interview process. I certainly shouldn’t have to say this, but in this day and age I feel I must: serious inquiries only. 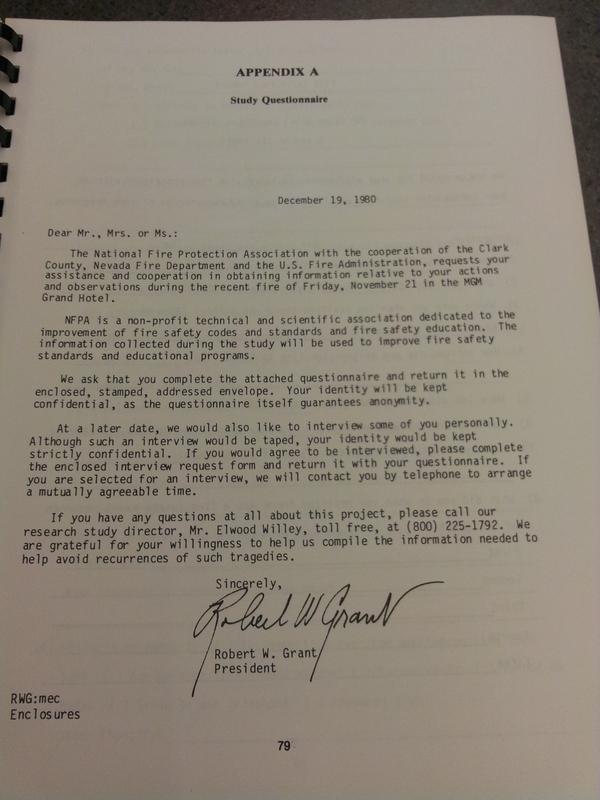 This was one of the most horrific hotel fires on record, and certainly not something to be joked around about or “fake survived.” Please save us both some time and don’t bother e-mailing to set up an interview if you were not present during the MGM Grand fire in Las Vegas on November 21, 1980. Thank you kindly in advance for your cooperation. Thanks for sharing that, Mr. Herbert. I’m going to e-mail you for further info regarding your knowledge of the fire.